If you are looking for a collision center in Vaughan or the surrounding area, and you need to have your vehicle repaired, then experience the difference by having it repaired at Pfaff Autoworks. Pfaff Autoworks is located in Vaughan on 214 Courtland Avenue, and we take great pride in being able to service the vehicles of Vaughan residents, and residents of the surrounding area. At Pfaff Autoworks, our team of professional technicians are very capable of performing the highest quality repairs on our customers vehicles, no matter how minor or major those repairs may be. A majority of our business at Pfaff Autoworks comes from our new Express Repair Service. If you are looking for a collision center in Vaughan to fix damage from a minor collision, you need to have a dent or scrape pulled or buffed out etc. our Express Repair Service can have your vehicle repaired in 3 days or less (Customers need to contact Pfaff Autoworks for available times). We understand that people rely on their vehicles, and being without one can be very inconvenient. If you are looking for a quality collision center in Vaughan to have your vehicle repaired after an accident, then experience Pfaff Autoworks Express or Regular Repair Service today. Traffic accidents that occur when one car crashes into a car in front of it. Rear-endings can be caused by sudden deceleration by the first car, or when the following car accelerates more rapidly than the vehicle in front of it. Also called a “T-bone” collision, or being “broadsided.” These occur when the side of a vehicle is impacted by the front or rear of another vehicle or a fixed object. These collisions are typically when the sides of two parallel cars touch and “swipe” each other. These collisions are when the front ends of two vehicles hit each other. Our collision center in Vaughan at Pfaff Autoworks has a wide variety of equipment and machinery that makes it very easy for us to perform high quality repairs to our customers vehicles. We repair every car exactly like how it was built and we will follow the manufacturer’s process for each and every type of vehicle. 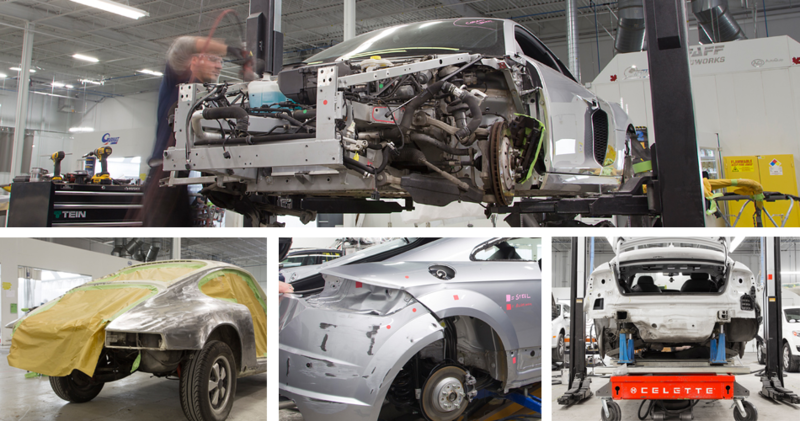 We can perform many services on-site at our collision center in Vaughan, translating to quicker repair times and a higher quality and level of service. For more information on the repair services at our collision center in Vaughan at Pfaff Autoworks, and how we can assist you after a car accident, please feel free to continue browsing through our website.Contact us at 1-866-674-3927, or by filling out our contact form.